Why? 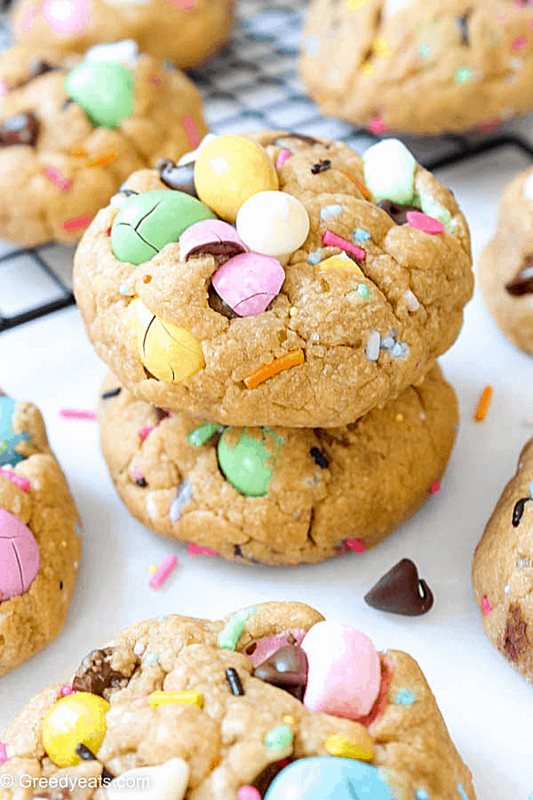 Coz these chocolate chip cookies are probably one of the BEST Easter cookie recipes that you will ever taste! Yeah, but why is that!!!!! Did you see? 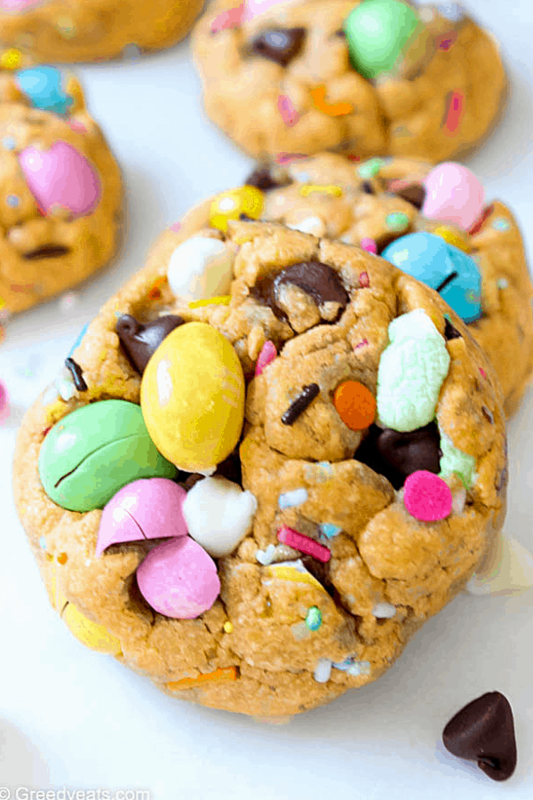 See the little Easter party going on inside these super soft chewy chocolate chip cookies? Then you my friend have come to the right place. Don’t over work your cookie dough. Apart from the usual gang of flour, butter, egg, salt, vanilla we are using more brown sugar than granulated to produce softer and chewier cookies. 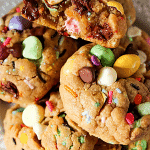 A little cornstarch in the dough bakes the cookies super soft and puffy. We are also adding baking powder instead of baking soda to make cookies soft. Baking soda bakes crispier/crunchy cookies. We want them to bake soft. So baking powder it is! Admit it. No one likes to bake tough, crumbly and flat cookies. No one likes to eat a cookie that is tough, super crispy and hard like a taco! Always chill this dough after you shape the dough into balls. Add a teeny-tiny bit of cornstarch to the dough. Don’t keep the butter out for too long that it starts to melt. Start working with it as soon as when pressed with a finger, you see an indent but butter holds its shape. Do not ever add too little flour. This will bake your cookies like pancakes, super FLAT! Adding too many add-ins. This one weighs down the cookie dough as it bakes. 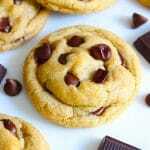 One thing I absolutely love about chocolate chip cookies is we can bake it for almost any occasion and still they never get boring! Thanks to a ton of add-in options we have. M&MS? Mini M&Ms? Love those pastel Easter candies! 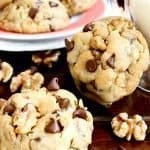 Nuts, peanut butter chips, Oh and chocolate chunks! Add or replace the add-ins as you please. 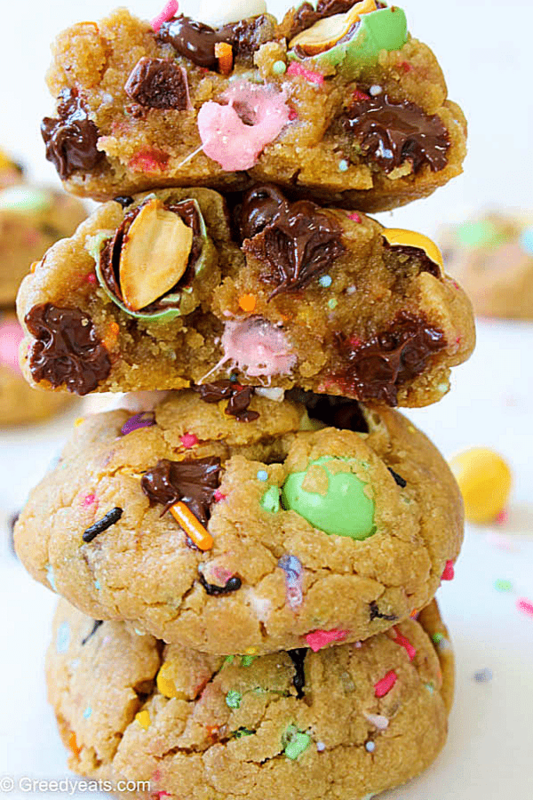 These cookies are sure to come out super thick, unbelievably soft and always a winner! 1. Beat butter and both sugars together on medium using a stand mixer or hand beater until creamy and fluffy. Add in vanilla and egg. Beat on high to combine for about a minute. 2. Sift flour, cornstarch, baking soda and salt on the creamed mixture and combine just until flour disappears. 4. When ready to bake, preheat the oven at 375 deg F and line your baking sheet with silicon mat or parchment paper. I like to bake 5 cookies in a batch. 5. Divide the dough into 10 equal sized portions. Don't squish the dough in your hands too much. Chill till the mounds are firm to touch (about 30 minutes). Bake for 11-14 minutes. Or till they appear golden on the outside. 6. Let the cookies cool on the sheet for 10 minutes before transferring on the wire rack to cool completely. This is the time to press saved add-ins to your cookies. 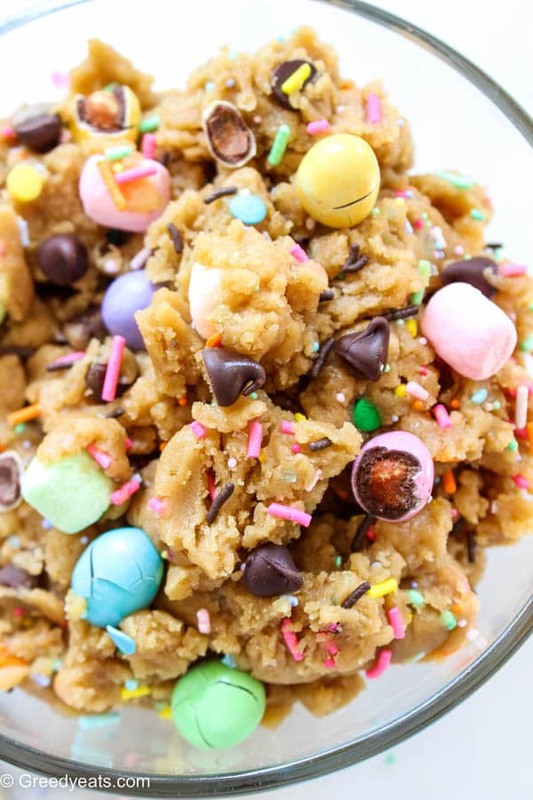 Cookie dough can be stored in refrigerator for 3 days, bring to room temperature and divide into 10 portions to proceed ahead with step 4 of recipe instructions. Unbaked cookie balls stay well in freezer for 3 months. Freeze them for a few hours on cookie sheet and then store them in zip locks. 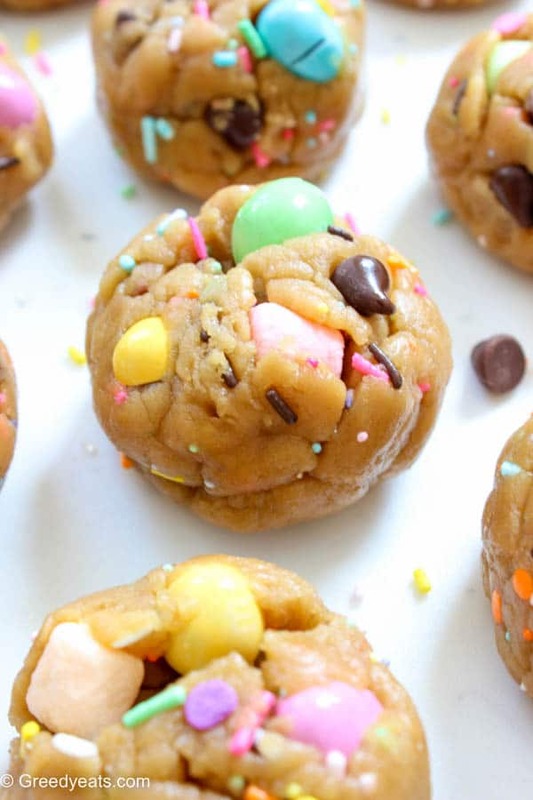 There is no need to thaw cookie balls before baking. Just bake them for an extra minute. Baked cookies stay good in freezer for 3 months. Thaw in the refrigerator, or at room temperature. You can also re-heat them in microwave for 15-20 seconds. 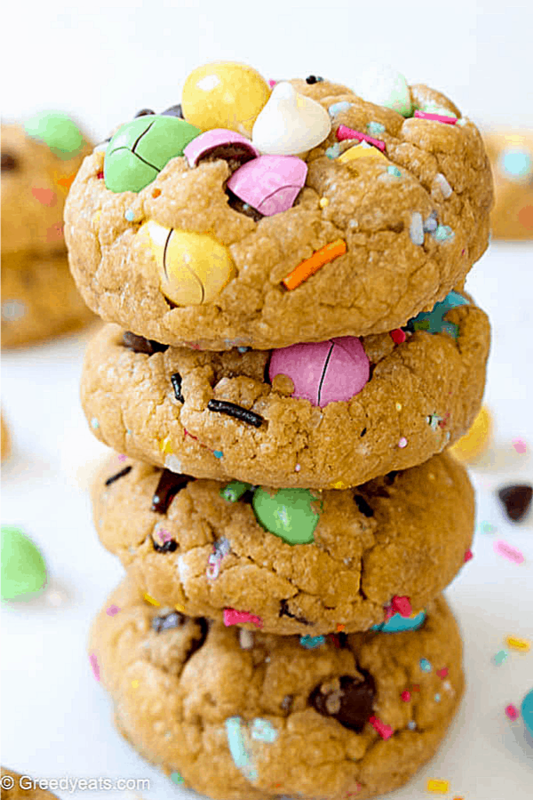 These cookies when reheated, taste very close to a freshly baked cookie, try it! Looking for more Easter treats? Try me super pretty and chocolatey cake pops. You will also love this mint bark, tastes just like a giant Andes mint! Slightly adapted from A Bountiful Kitchen. OMG these are do pretty, I LOVE them!! Not to mention sweet and delicious. I bet the house smells great when they are cooking!! I can see that these would be super fun to make with kids also. Thanks for sharing such a great recipe!! 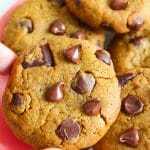 My kids have always been fan of chocolate chip cookies and I’m always trying my best to serve them with home baked ones. Loving this one! 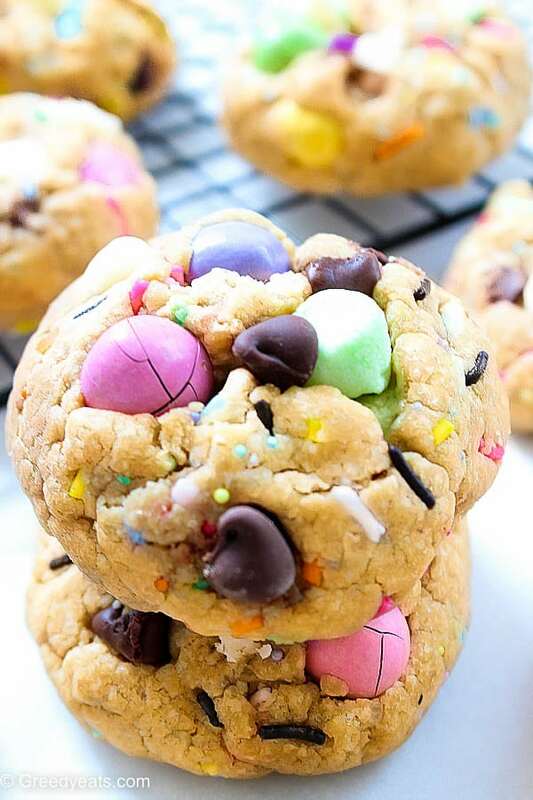 Soft and gooey cookies are my ultimate favourite and these couldn’t look more fun too! My two boys would go bonkers for these! 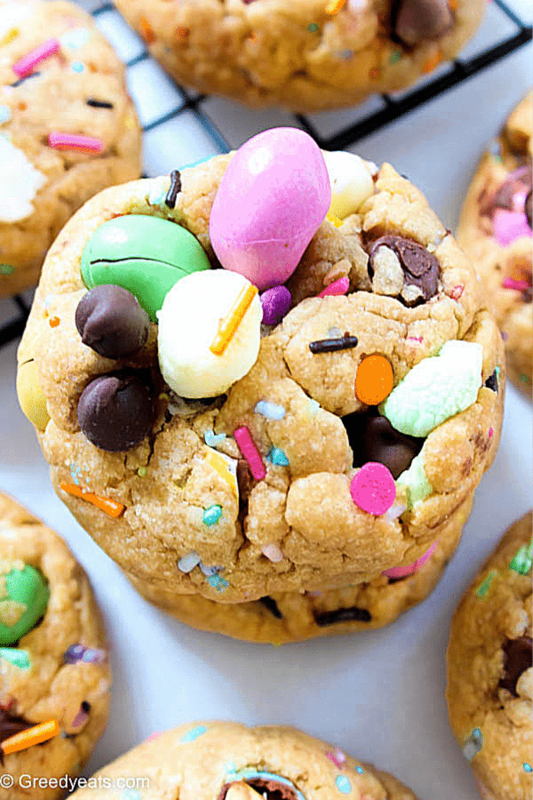 Perfect Easter bake! Surely a lovely and delicious gifting option for Easter. These are so cute and my kids love it. 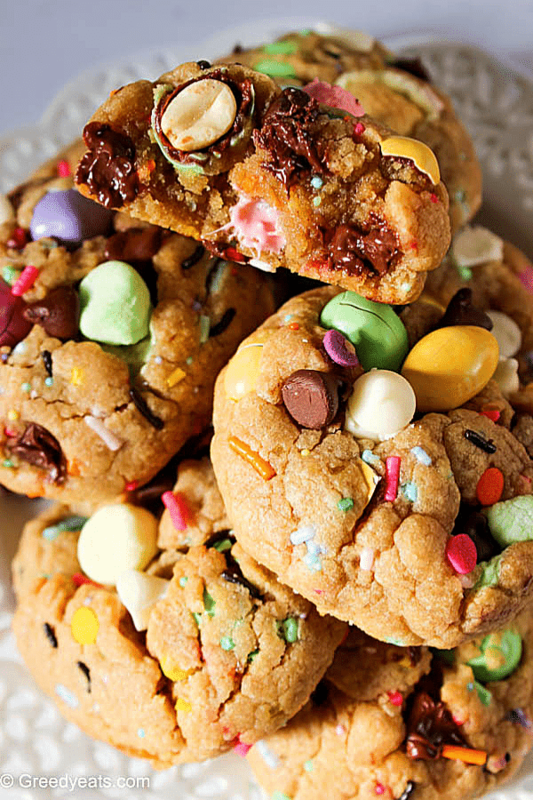 These cookies look absolutely divine. 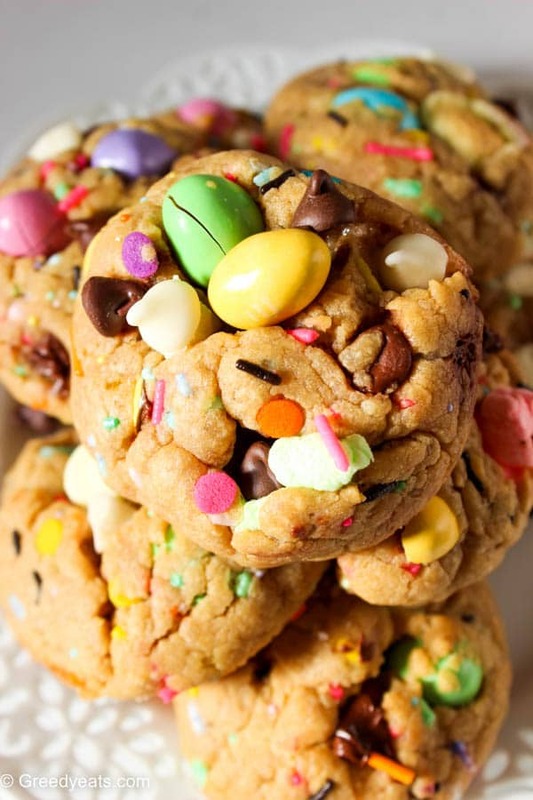 Who am I kidding though, I have a cookie problem and these would satiate my hunger. 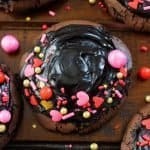 Now these are the best looking cookies! Love the fun colours and the taste – even better! These look AMAZING! Love the colors of M&M’s you used!! Amazing recipe and great explanation in instructions! Thank you! That bite shot with the melted chocolate got me! They look amazing! Perfect for Easter. Sharing! Omg that chocolate inside is making me drool!! 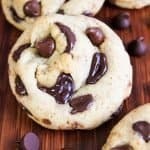 the kids will flip when I make this recipe! How pretty these are and so festive thanks for posting!